The Great Fire of Rome started in the markets around the Circus Maximus (chariot stadium) and it destroyed a large percentage the city. At the time of the fire, the majority of Rome’s buildings were constructed of wood so it spread very quickly. It completely leveled III of XIV ‘suburbs’, severely damaged VII suburbs and left only IV areas untouched. The fire also destroyed Emperor Nero’s palace and several important temples. Historians differ on how long the fire lasted but most believe the fire burnt for V days & VI nights. In the aftermath of the fire Nero went on to build new palace complex and to make new laws to ensure buildings were made out of marble & stone. He also ensured the streets were widened and water was made available throughout the entire city. The debris from the fire was used to fill in marshes around the city and this inadvertently stopped the spread of the diseases like malaria. An urban myth states, ‘Nero fiddled while Rome burned’. This cannot be true since the violin was not invented for a M years after the fire. 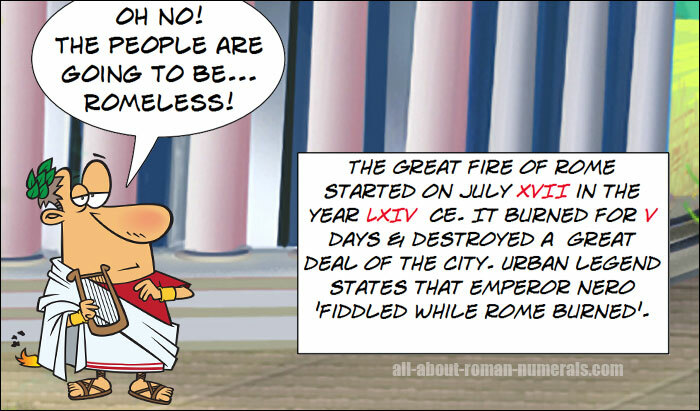 Also, Roman historians place Nero in another part of the country at the time of the fire.